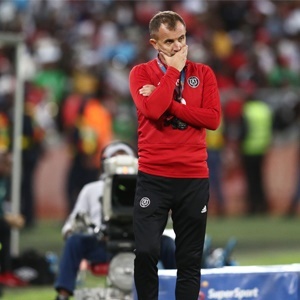 Cape Town - Orlando Pirates head coach Milutin Sredojevic said his side dominated Mamelodi Sundowns and were more the side who fought to get a win at Orlando Stadium on Monday. In an exciting encounter that had been billed as a potential title-decider, the two sides looked to dominate in search of a win with the lead of the Absa Premiership table on the line. Pirates looked the more threatening in large periods of the game when playing some scintillating football that had Masandawana on the back-foot. Sredojevic in a post-match interview said his side were the better of the two and were unlucky to not come away with a win. "From start to finish we showed that we were the team who much more wanted the win," Sredojevic said. "Our opponents sat back and defended, hoping to catch us on counters. "Despite that we created chances, the only ingredient that was missing for us was the final ball. It's not easy to play against an experienced, well-coach team like Sundowns. "I believe that we tactically had answers for everything that was thrown at us and with the unfortunate injury to Wayne Sandilands, that robbed us of one more attacking substitution. "With this we have shown to ourselves that we can outplay our opponents, not outscore, but outplay them which will give us a morale boost for the remaining six games.